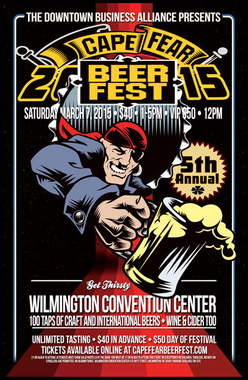 Valid for one general admission to the 2015 Cape Fear Beer Fest main event. Saturday March 7, 2015 at 1pm. Please bring your voucher and valid ID to the Will Call ticket booth on the day of the event. 21+ only! Lots of fun with a lot of like minded people. Taste all the brews with your admission ticket that you like. Well, you can’t taste all of them. With a cab or Uber you can , maybe. It’s the 5th Annual, so fire it up. SPECIAL EVENT! Only 200 Tix Available (sold seperately from this encore deal). Hosted by Ironclad Brewery (2nd and Princess). Join us for a great night rare all Cask brews at the all new Ironclad Brewery. We will serve up select specialty brews to a limited crowd. Tickets will go fast.